SIDMA College Sabah in its effort to produce Early Childhood Educators (ECE) equipped with the necessary competencies expected in a 21st Century workplace, provides an actionable framework for its students, who are also future teachers, to implement a long term professional development plan that will extend their professional development beyond daily classroom lectures in order to create “coaching culture” enabling lecturers to provide the necessary scaffolding. Towards this end, the college has introduced a variety of forms of delivery technique to enhance its students’ learning. This is to provide various forms of interactions and participations for these future teachers to select their “tools” and “components” from a diverse “pools of blended options”. As these currents ECE trainees are facing little or no access to the outside world, particularly for them to understand and interact with their future kids, Miss Nur Syafiqah Binti Usno, SIDMA’s Early Childhood Lecturer, with the full support and collaboration of the college management team, her colleagues and the 105 semester four (4) ECE students, conducted an Early Science Expo at Methodist Kindergarten, Kota Kinabalu recently. The main focus of the programme was to let these future ECE teachers to communicate and engage with the kindergarten kids, to capture and reflect on their experience on how to interact and react with these kids, as well as to find out their strength, weakness and determining improvements needed when handling these children.. The ECE students were divided into groups, and they have set up nine booths at Methodist Kindergarten Hall for the function. Each booth were packed with objects – natural objects, 3D models, carts, pictures (cards), computers and CD, colour pencils, drawing papers, hand outs (worksheets), I-think maps, toys, balls, crayons, big book, all relating to the twelve main themes of the kindergarten curriculum. All the children from Methodist Kindergarten were invited to participate in the event. Led by their respective teacher, the kids were initially given the opportunity to engage themselves with all materials being displayed in each station, make inquiries, give their opinions, comments; all being facilitated by their teachers as well as our SIDMA students. The next activities required the kindergarten students to perform some sort of experiments or classification activities either in groups or individually; and again being facilitated by SIDMA students as their facilitators. All activities are to enhance the kids’ abilities and skills to make use of their senses, particularly in making observation, giving simple remarks, labelling and recoding it in the i-think map provided, and more. According to Miss Nur Syafiqah, SIDMA students have really enjoyed themselves and benefitted from the event. 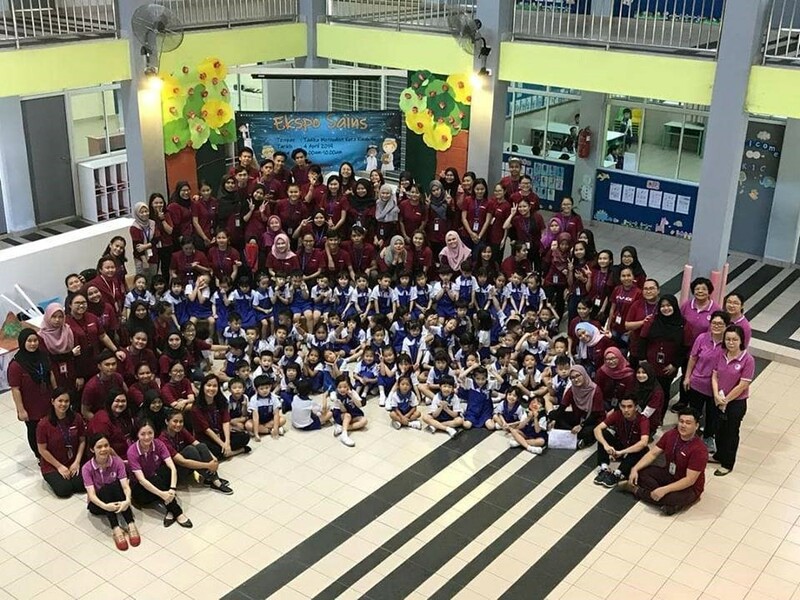 They realised that although the kids are only from kindergarten, but their English mastery, their knowledge, thinking and inquiry skills are very high, especially the six (6) years old kids who have gone through the twelve (12) learning themes with their teachers. They are quite knowledgeable and very enthusiastic; and are very keen to find out and learn more from the expo. The students realised that to be teachers in kindergarten is not a relaxing career, but a very demanding one. They really got to read and understand kids’ behaviour better and being able to fulfil the children inquisitive instinct of asking and wanting to know more. Most important and most urgently needed is that they got to upgrade their mastery of English Language. It is a preparatory programme for one year. Upon successful completion, students will gain an entry qualification to degree programmes in area of Education (including Early Childhood Education), Business Administration, Management, and more. Diploma in Occupational Safety and Health. Financial assistance such as Education Loan from the National Higher Education Fund (Perbadanan Tabung Pendidikan Tinggi Nasional – PTPTN) is available upon request. For more information about courses offered at SIDMA College Sabah, please browse SIDMA Website, or like SIDMA Facebook Account – SIDMA College. .One can also visit SIDMA College Campus located at Jalan Bundusan, 88300 Kota Kinabalu. You may also visit https://sbah.sidma.edu.my/sidmalearning/landingpage_form to register. For more information, please call SIDMA Hotline: 088-732 000 or 088-732 020. This entry was posted on Friday, April 12th, 2019 at 8:38 am	and is filed under SIDMA College City Campus, Kota Kinabalu.. You can follow any responses to this entry through the RSS 2.0 feed. Both comments and pings are currently closed.